Beautiful Set of Currency $1 $2 $5 U.S. Paper Money $1 2006 GEM! $2 2003 GEM! $5 2006 with the New Colorful Design GEM! 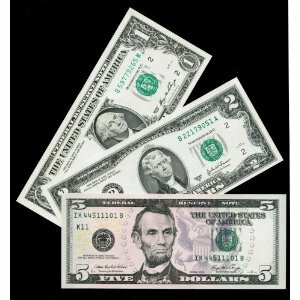 Beutiful set of U.S. Federal Reserve Currency hard to find all 3 in Crisp GEM! condition. Buy it now in a few years you'l be glad you did.